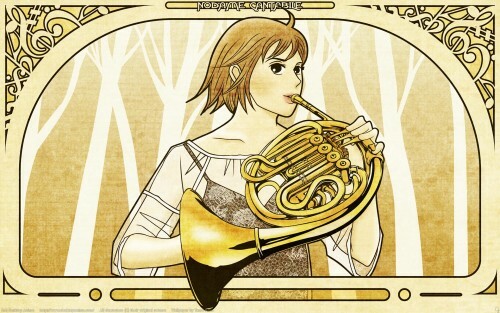 A Nodame Cantabile wall in the Art Nouveau style. You can never have enough Nouveau. Basically, I thought Nodame's pose in this scan was well suited to an Art Nouveau style portrait. The skeletal trees in the back had a Nouveau vibe anyhow, which is what tipped the scales for me. Also, I wanted to play with framing, where part of the character is inside the frame and part is in front. Trace, with gradients to create soft shading. I had fun doing the lacy pattern on Nodame's blouse. Some texture (including a musical sheet texture) as well as a color shift to browns to give it a bit of that old-time feel. Although initially similar to Letort Nouveau I opted to go for musical notational swirls instead of the more classic floral/leafy swirls of Mucha's style. I designed the frame so it could be extended horizontally instead of creating 3 frames to match a 16x10, 4x3 and 5x4 monitor resolution as is my usual wont. If you don't like this resolution, go find a better size at DA! Desktop Anime. Oooh...very nice. I like the musical border and the actual portrait focus. :) It looks great! yaya! nice wallie with very beautiful details. i like the style of manga of nodame, but the anime style is more likeable to me. anyway, i first saw the liveaction, later the manga and now im looking the anime. The outlines look great and the horn looks great! Nicely done! This is gorgeous and inspiring. I love Art Nouveau and Nodame and I think it was an excellent idea to combine the two here, given the skeletal trees background. Cool, the frame looks very interesting. And awesomeness.